Or look for books at the Capital Area District Library. Use WEB PATH EXPRESS to find even more teacher approved web sites for your research! 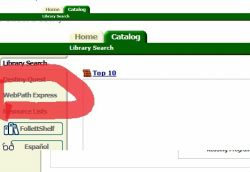 2) Click on "Washington Woods Library"
3) Click on "Catalog Tab"
4) Click on "Web Path Express" from the menu bar. Use Kids InfoBits, a free and age appropriate database provided by Michigan eLibrary. 3. Scroll down until you find "Kids Info Bits" and click.